Running on the SAP Cloud Platform, orgmanager [web] for SF can be launched directly through the SAP SuccessFactors user interface (via home menu or product tile) including single sign-on. The visualization shows any person within any kind of structure (e.g. organization view) in a few seconds. The user is able select himself or any colleague in SAP SuccessFactors and directly access the organizational chart (via action menu) at that point of the structure. Due to the seamless integration of orgmanager [web] for SF, permissions specified in SAP SuccessFactors are taken into consideration for the org chart visualization. Why not add the visualization of KPIs and with that HR controlling to the list of workflows that org charts can facilitate? From headcounts, absences, talent data, average age or budget overrun, the extension has you covered for any conceivable use case you required. The generated comprehensive HR reports deliver key insights to help your organization make informed business decisions. In addition, you can use the big data visualization to show large organizational structures and to offer an informative dashboard. By adding visualization rules, important key figures can be highlighted with symbols or colors. Workforce planning and organizational change management becomes an intuitive and easy task with the simulation module. It allows you to simulate multiple scenarios of the organizational hierarchy directly within the existing org chart via drag & drop. 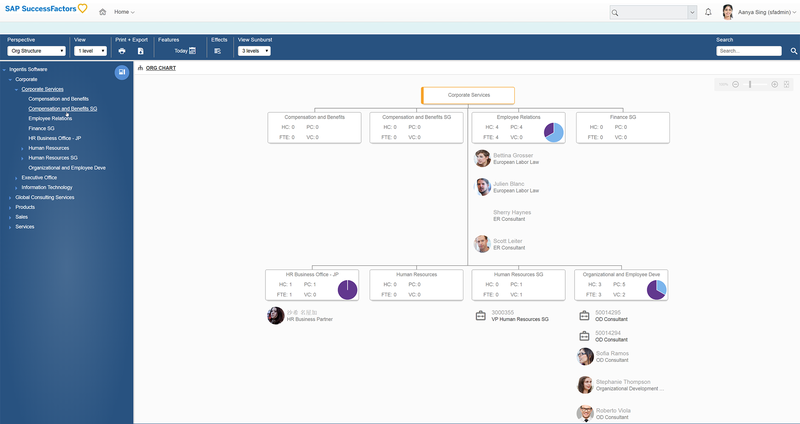 orgmanager [web] for SF is able to visualize any structure maintained in SAP SuccessFactors™. This includes objects (Legal Entity, Business Unit, Division, Department, Location, Cost Center) and all relations. Org charts on your PC, tablet or smartphone – org.manager [web] for SF offers several display options that all enable a smooth visualization of your org charts. Ingentis org.manager [web] for SF offers web print functions and comes with the ability to export org charts into PDF and PNG or download data in an Excel file. Define the content, layout and design of your org chart according to your wishes, e.g. based on the corporate design of your company, and publish different versions to make your colleagues happy. Numerous search abilities such as fuzzy search or extended search allow for a comfortable navigation through your company chart. Feel free to define your search and hit list individually. It is essential for every organization to be able to rely on up-to-date org charts. As they are based on HR data, a seamless integration into the HR-System is indispensable for the org charting application to be accepted. The same goes for the the solution’s visual format which needs to be modern and intuitive. Ingentis org.manager [web] for SF provides all of this and more. See for yourself. Mergers and acquisitions are one of the most potentially beneficial business events for an organization, but they can also be fraught with significant risk when executed poorly and ultimately be very costly to the organization. With org.manager [web] for SF, simulations can be created in a powerful and user-friendly manner – from restructurings via drag & drop, the creation or removal of departments, individual employees or vacancies, to editing attributes. During merger and acquisition projects, additional data can easily be imported. With two org charts displayed side by side, it is possible to move objects from one to the other via drag & drop. As reorganizations can turn into a lengthy process, SAP SuccessFactors Intelligent Services offers real-time updates of the simulation database which reflect the changes in the HR system. This way, we can keep simulations in sync with the current organizational structure of the company. The comparison of datasets enables a detailed overview of simulation for any desired key date. Structural changes can be checked easily and transferred to SAP SuccessFactors in a manual or semi-automated way. Uniting organizational structures directly in org.manager [web] for SF – for a more efficient use of resources and to enhance transparency. The reorganization can be performed directly in the real-time org chart. As a result, all of the changes made in org.manager [web] for SF can easily be transferred to the HR system SAP SuccessFactors. Access org.manager [web] for SF directly from the SAP SuccessFactors menu and Employee Profile to display any kind of hierarchical structure from SAP SuccessFactors. You are flexible in the visualization of key figures within the organizational chart. Reorganizations are performed via drag & drop. In addition, you are able to integrate your org chart into other applications or portals. Save time by shortening everyone’s way of information retrieval from Employee Central by integrating org.manager [web] for SF into your company intranet portal. Or present the org chart on your SAP Jam page. By providing the organogram to your employees, they will find a virtual corporate directory at their fingertips that’s searchable and up-to-date. Organizations are changing. The new workplaces are agile and in constant flow. As things move a lot faster, HR departments face overwhelming bureaucracy processes when visualizing up-to-date team structures. Use the flexibility of org.manager [web] for SF and SAP Jam to connect people with up to date information for structured work. Encourage employees to add their temporary project groups to SAP Jam. As soon as the agile teams are created, they are shown in the real-time org chart, which relies on your Employee Central data. Our consulting team is here to set up org.manager [web] for SF for you, in the language you wish, on-site or via online meetings. We are happy to work on your individual requirements or pass on practical knowledge in our customer-specific trainings. Why org.manager [web] for SF? Discover, try and buy – all in one place. That’s what the SAP App Center is all about. And org.mangager [web] for SF is one of the featured apps there. Click on the button to buy the org charting tool straight from the app center. Do you have any questions regarding org.manager [web] for SF? Are you interested in a consultation? Don’t hesitate to contact us via the contact form below. We look forward to you hearing from you!